We have moved away from card payments due to charges being made and having to pass them on. We will be taking cheques and cash also bank transfers and Paypal friends. This will reduce the selling costs to 10% Sell your own for only 10% if you want to add yours for sale contact admin. 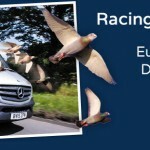 All birds have £50 to England & Wales & £60 to Scotland & Ireland to be added as we use Walker's transport, this is up to 15 pigeons, there is a separate place on site to book this, if you want to make your own arrangements, contact admin. Remember it's a free site and free to join.